Solar flares are massive bursts of electromagnetic energy that periodically erupt from the Sun. The intensity and frequency of solar flares occurs in an 11 year cycle, with the next peak predicted to to occur in late 2013. So we are now entering the peak phase of this cycle where we can expect more solar storms. The largest sunspot for years appeared on May 9th 2012 which scientists are calling a “monster sun spot”. It is so big that it is observable to the naked eye (don’t look directly, look at the pic on the right), and is expected to “unleash powerful solar flares” [Discovery News]. In this post I will briefly look at the astronomy, and then the astrology of solar flares, their effect on us. Solar flares results in coronal mass ejections (CME’s) which are explosions of enormous amounts of energy. This electromagnetic energy covers all wavelengths, some we can see, some we can hear, but most is not detected by our five main senses. Solar storms have an effect on the Southern and Northern Lights, and on communications systems. Intense solar storms like we are in for in the next couple of years can results in geomagnetic storms, such as the one in 1989 that knocked out the the power grid in Canada’s Quebec province. Apart from the inconvenience of blackouts, what effect do solar storm have on us humans? Astrology is the study of the effects of celestial bodies on our lives. The most important body in the heavens is our Sun, we cannot live without it. It gives us life so it is identified with our life-force. Scientists say that solar storms have no effect on us because our magnetosphere protects us from the radiation. Well it don’t always protect the power grids or communications systems! Electromagnetic radiation, which pounds us in large doses during solar flare activity comes in so many forms, many undetectable. These include light, heat, microwaves and radio waves. This takes us into the more philosophical side of astrology, and how astrology actually works. Inside the earth is a single crystal of Iron, nearly the size of the Moon. The Earth’s Core Crystal acts like a massive conductor of all the electromagnetic radiation coming from the heavens, constantly changing depending on the relationships of the heavenly bodies to each other and to the earth, and of course, changing in response to the energy hitting us from the Sun. As electrical bodies ourselves, we are sensitive to the changes in the earth. Now I want to quote astrologer Michael Erlwine who has been researching solar flares for many years. You can read more of his writings in Solar Eruptions and the Self. Mercury Retrograde, not Solar Flares. Mercury left the retrograde zone over two weeks ago. I’m blaming my fuzzy head on solar flares! Head pounding… Check! This is another clue to my head pain issues. Yes, I’ve had electrical storms and yesterday a 24hr head pain that felt like a nerve about an inch long accompanied by anger and dreams. Solar Flares… can affect industries that rely on GPS and other systems of Satellite. 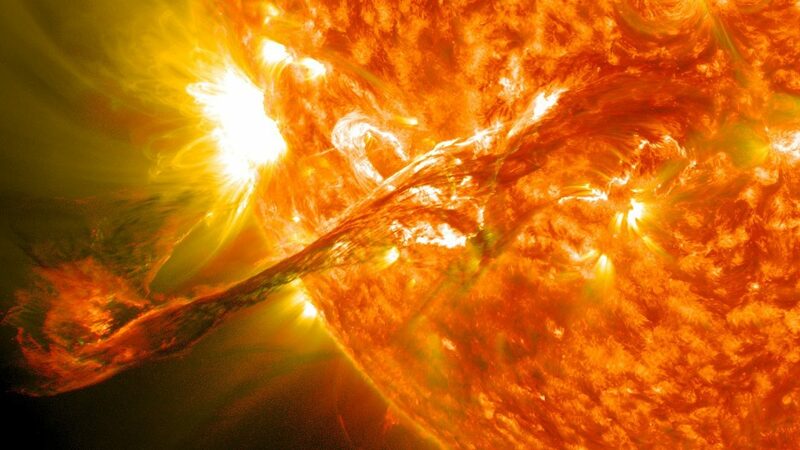 Solar storms can lead to damage to the satellite, and the disruption of air traffic controls. The worst solar storms in 1859 solar storm the strongest on record, causing flashes of the lowest bright in many parts of the Western Hemisphere: Observers said in Cuba that the sky at night, “seemed stained with blood and led to the disabling systems telegraph all over the United States and Europe and in the some cases, burst into flames. There was also a strong storm in 1850, where disrupted services lightning and another in 1989 and led to the spare power supply for nine hours in the city of Quebec in Canada, and can cause the place these days to cut power systems, electronics and infecting permanent damage, potentially causing trillions of dollars losses, the scientists said there is a chance of about 12 percent that the storm would hit the ground within the next 10 years. This was the Carrington event called after the person who first noticed it. The sunspots were visible with a naked eye and massive. They also changed/moved rapidly. Electric blue sparks broke out in telegraph machinery and systems and some buildings ere seen to have blue “fire “around them. Hey Jamie, The flares are not to be counted out but might be another cosmic event that effects sensitive people too. Maybe depending on where it strikes their chart also. You are in Eastern Australia ,Right ? The Moon just had a conjunction with Pluto on May 9th aligned with you physically. You may be feeling that. This is all I can think of…. leave it to you marnia to actually find one! Aquarians are majicians materilizing thoughts! fixed air implies substance. Aquarians are often stylish make their own out of the fantastic. Or a Van Halen belt! I want a pair of those!!!! Hahaha! Your amazing Marina after all the stuff you have had to go through you still have a great sense of humour. Jupiter rising I guess hey? And yes I want some too, but I think my big Jupiter arse would look too phat in yellow. Close. My sun is in sag but i am ruled by the sun! Leo ac 23 d. I i like orange and red better though! All colors are great. The more the merrier. I would look like a clown in those myself!!! had headache, heart beat irregularity and feeling whacked with flu! just read the solar flare info…and it was insightful…just hoping this will lighten up soon…(also been having Saturn oppose my Sun since October, and truly counting the months until it passes by October 2012 it has been exhausting and hard going eg my best friend committed suicide, I had a huge pay cut, every house I’ve rented has been a nighmare with nothing but problems, weird really, and I have literally felt ‘cold’ inside my body and physically battered, but hey ho, got an interview in a few weeks and maybe life will transform ;)…thanks for great info guys…be well …. Ok this explains why i have been feeling so tired. There’s no logical reason. Cause i just had a week ioff!!! Even when a solar flare doesn’t corrupt power grids it is still having a deep effect via ionisation. There is a marked rise in heart attacks and hypertension illness during solar flares. I thin the London riots last year followed on from an X flare. THat’s very consistent with what Erlewine says. They also seem to effect Earth quakes. electric discharges on the Sun that cause sunspots also affect the Earth’s ionosphere. The ionosphere forms one “plate” of a capacitor, while the Earth forms the other. Changes of voltage on one plate will induce movement of charge on the other. But unlike a capacitor, the Earth has charge distributed beneath the surface. And if the subsurface rock has become semi-conducting because of stress, there is an opportunity for sudden electrical breakdown to occur through that rock. The mystery of how the current is generated is solved and the link with sunspots exposed. Subsurface lightning causes earthquakes! Seismic waves are the equivalent of the rumble of thunder. The energy released may be equivalent to the detonation of many atomic bombs but only a small proportion needs to come from the release of strain in the rocks. Most of it comes from the Earth’s stored internal electrical energy. This explains earthquake lights and also lightning coming from volcanoes. I can relate to what Michael is saying about one’s sense of self. I had one surprising moment of being surrounded by feminine energy that defined me – and yesterday another of interacting within with a woman and then she gave me a camera so I found 2 sailboats to capture. Venus in gemini? Where is this going. A day of intense pain angers and stress dreams and then such relief to come back to normal. Where is one at now? Changes within – are they entirely real or what. ? I ask. Two years of this? Oh no. and everybody else in the same confused place – yikes. All we can do is try to make it all good for everybody i quess. Solar storm headed toward Earth after solar flare. TWO big explosions on the surface of the sun will cause a moderate to strong geomagnetic storm on Earth in the coming days, possibly disrupting radio and satellite communications, scientists say. The unusual storm is not likely to wreak havoc with personal electronics but may cause colourful night-time auroras, or displays of the Northern Lights, late Friday and early Saturday.